Outstanding tips and advice on gardening! I think I have entered that part of the season that I call “in-between.” Summer is coming to a close and Autumn is not really here yet. In the southern part of the United States, it is still very humid and hot! Our little ones are going back to school and fall clothes are still packed away, waiting for chilly weather. In the garden, it’s a little like the end of a school play. Everyone has witnessed the drama and now everyone is standing around with a cup of punch and a cookie, waiting to go home. A lot of my perennials have bloomed like mad and are now waning. Flowering trees have done their thing and are setting fruit. Due to the large amounts of rain this summer, some of my annuals didn’t get deadheaded properly, so they are underperforming. Weeds are unfortunately prolific, also due to the ongoing wet weather. But…there are some interesting things going on. My lemon grass grew to a huge size. The pictures below are of when I first bought it and today, respectively. I also made sure to use the exact same pencil for scale. I was warned that at the end of a season it could approach the size of a Volkswagen. I was unhappy with the taste of it. It was not pronounced enough for me. It might be due to the overwhelming amount of water it received. …and the end of the season. I also noticed that a lot of my plants acquired red or orange leaves due to stress. I have seen this happen in a very hot, dry summer but never due to a deluge of rain. 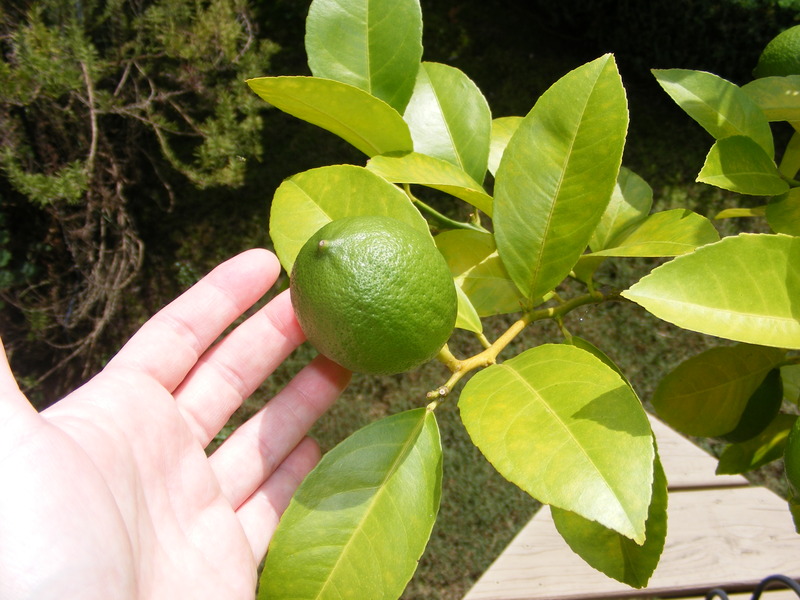 My Meyer lemon has lots and lots of fruit. 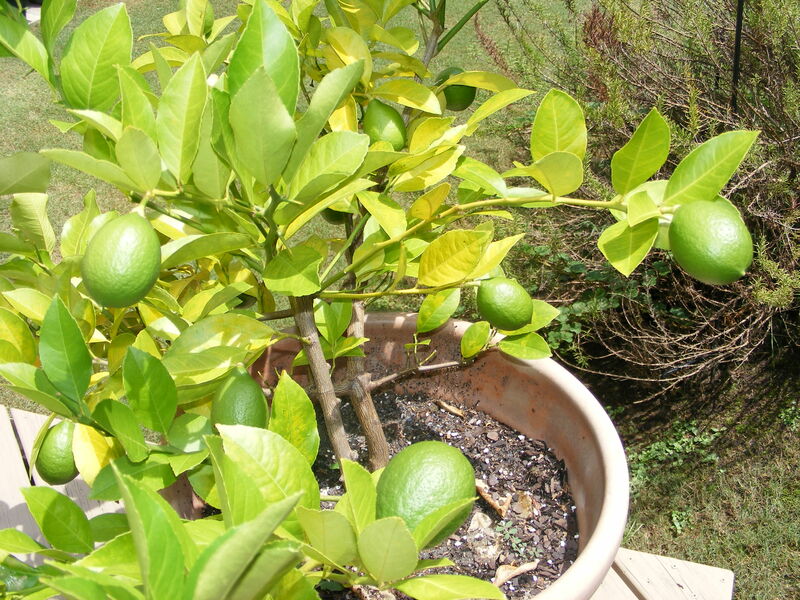 Just like the Italians, who grow citrus in pots and move them inside during the winter, I have lemons until the middle of December. People visiting around the Thanksgiving holidays, at first think they are fake. A holiday decoration. 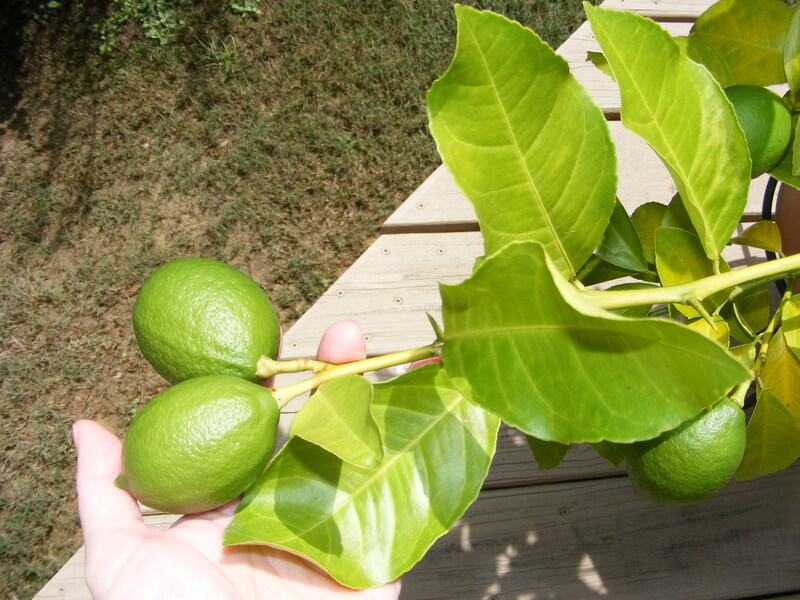 They are so sweet and luscious, I try to think of special things to do with them other than just using them for tea. Zinnias are one of my favorite annuals and it performed well this year. When I see them, I always think of my oldest son, Nathan. He convinced me to grow them one year. I used to be a Zinnia snob, thinking they weren’t as sophisticated as salvias, roses and coneflowers. They won my heart, pumping out brightly colored discs. The butterflies and birds agree with me. Catnip sprang up in one of my homemade compost bins. After witnessing how well it worked as a mosquito repellent (see my previous post), I didn’t have the heart to rip it out. I hope it reseeds itself around on the ground and anywhere else it wants to grow in the garden. I love perennials. The idea that they go away in the winter and then come back every spring is magical. I know they don’t always flower as prolifically as annuals, but their loyalty every year makes you want to hug them. My garden really is similar to a school classroom in that every plant in my garden has its own strengths and weaknesses like individual kids in a class. The tiny, feathery flowers are put in the front, so the teacher can keep an eye on them. The big, overgrown, shrub that looks just like a football player, sits in the back of the class, sometimes driving the teacher crazy. I guess kindergarten really does relate to so much of life. Even gardening. 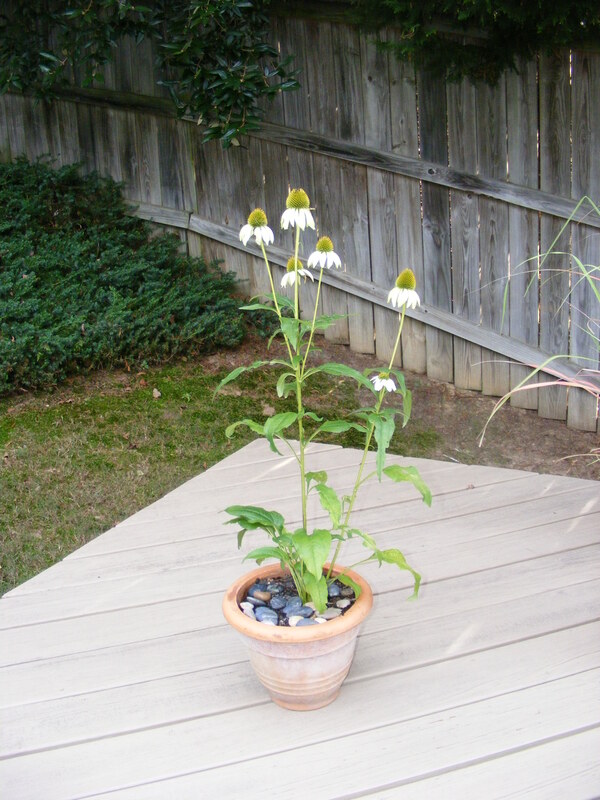 My current little kindergartener on the deck is coneflowers. They really are a wonderful plants. They come in several colors. 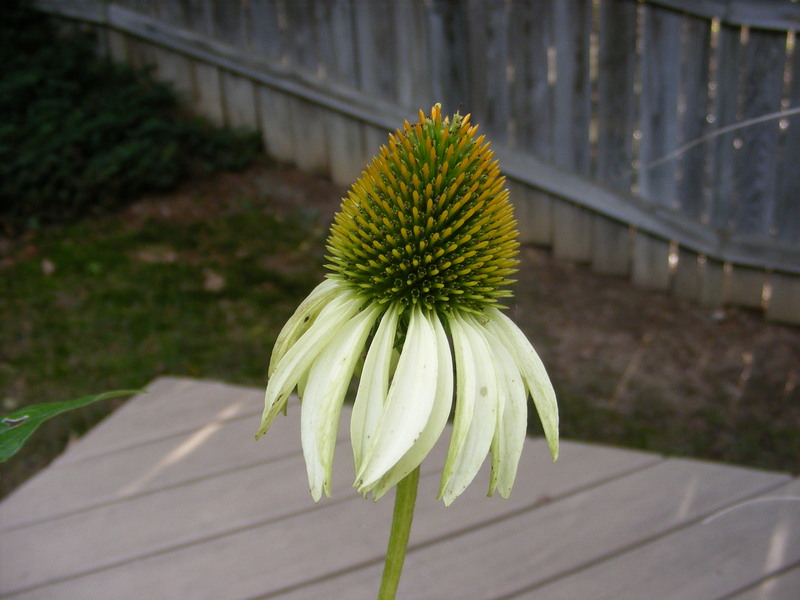 My coneflower is white with petals that stretch downward when fully open. 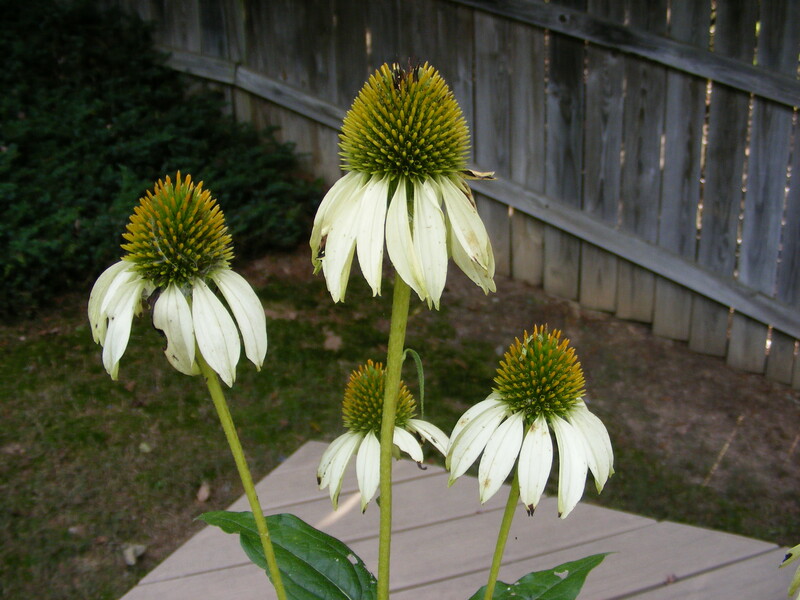 One of the great things about coneflowers is that tiny finches love to eat the seed that the flowers generate. The birds hang on to the bobbing flower-heads and pull the seeds out of the center of the flowers. It’s fun watching them act like acrobats in a tiny circus. Last year, my kids and I watched a tiny yellow finch visit our kitchen window every day. We would hear a tap-tap-tap and look up to see him hanging on the window sill. It’s almost as if he tapped to just say hello. How are you humans? Everything okay? I guess I need to find a place in the garden to put the coneflowers. They can be planted, in the garden, in the spring or fall. They did very nicely on the deck. I’m a proud plant Mommy. Right now my life consists of doing things in between rain showers. And in between the showers we get thunderstorms. Any sunlight at all makes everyone in the family look up from what they are doing and exclaim, “Sun – oh, wow!” I think you get the idea. It’s wet and has been wet for a couple of weeks! My son arriving home from summer camp with a trunk full of wet clothes didn’t help raise our spirits, either. Hanging up a sopping wet sleeping bag only highlights how damp we already feel. 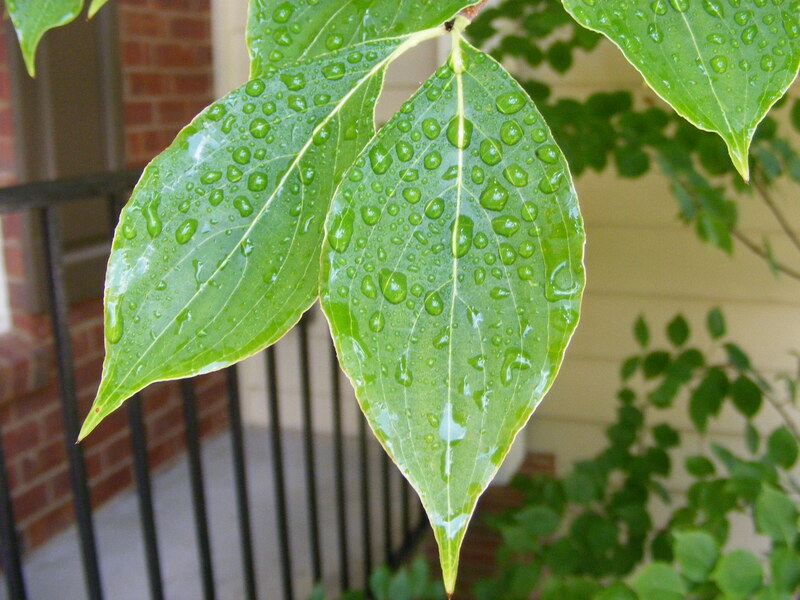 As gardeners, what can we do in rainy situations? I have found it is best to wait it out and do your gardening chores when the weather dries out. You run the risk of compacting the soil if you garden in the rain or just after rainy episodes. Besides, trying to plant and dig holes in the mud just makes everything a pain. Also, the plant’s roots can have a hard time becoming acclimated in sticky mud. With that said, I have been known to sneak outside after a rain shower and carefully pull weeds out of flower beds. The rain makes it easy to pull the little buggers out! I’m careful to stand on flat rocks or bricks placed strategically throughout the flowers. Hopefully, I’m not causing too much compaction. I also take this time to notice any water accumulating in areas that may need addressing. Be especially careful to keep water away from house foundations. That could be damaging to the outside and inside of your home. Make sure planting beds slope away from your house for proper run-off. Keep your house gutters clean, too. If you can, don’t have any bare soil. Rain will compact bare soil and quickly deplete it of nutrients. 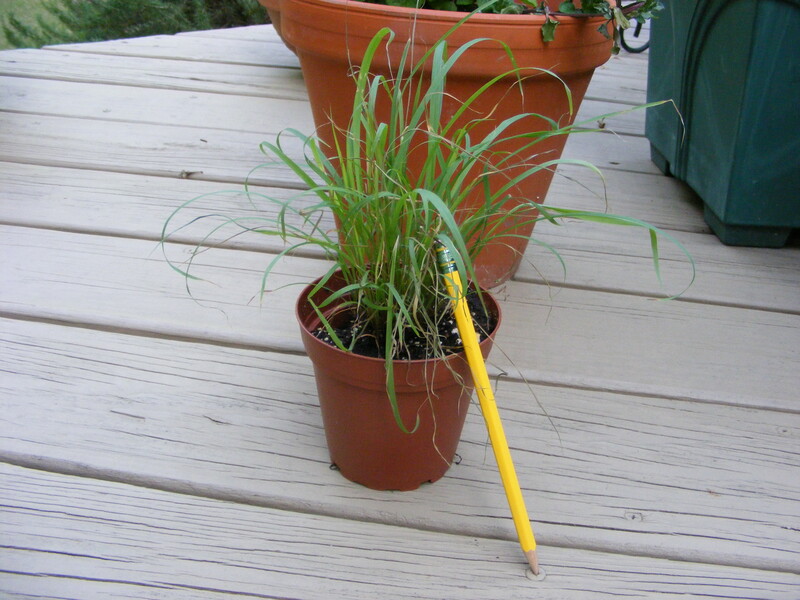 Plants hold the soil in place and act as tiny umbrellas helping to avoid soil erosion. 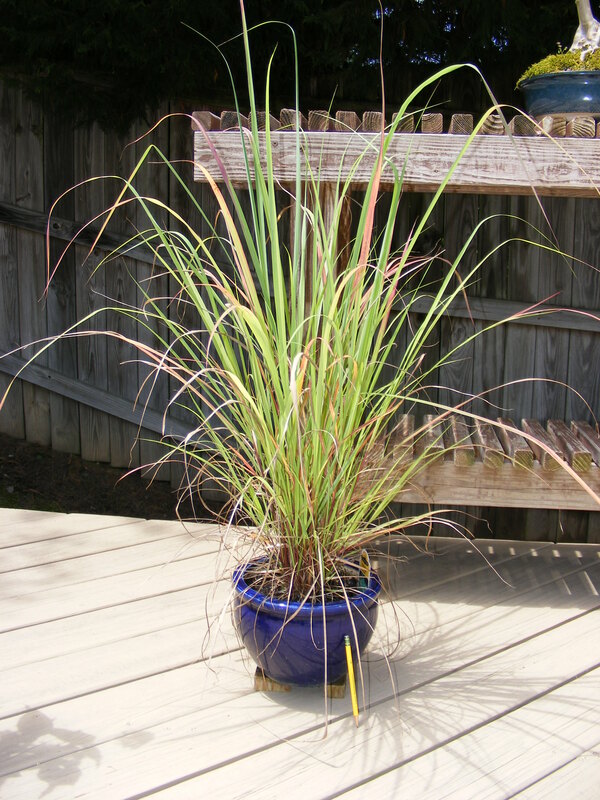 Plants also draw up water, reducing the run-off into sewers. If planting is not possible at the moment, put down mulch to help with erosion. 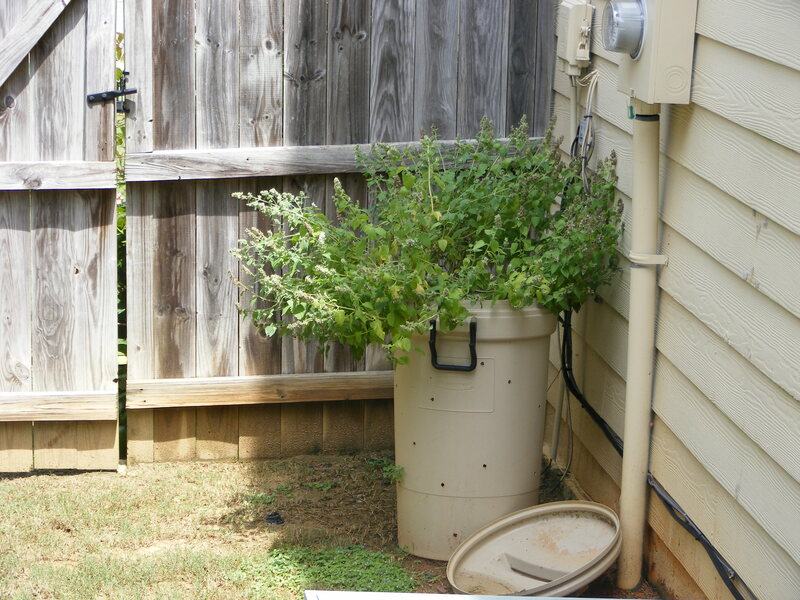 Make plans to put water barrels at gutter downspouts to catch rain water. We had a roofing company attach forked downspouts on our rain gutters. This ingenious contraption lets you flip a metal switch between your water barrel and your downspout. When a barrel gets full, you can flip the switch and let the water run out the normal course. I even attached a metal hook to a broom handle and I can reach the switch from an open window. The neighbors must think I’m crazy! I have one last suggestion for rainy day gardening activities. Put together a garden planner. I did this one year and really enjoyed it. Taking care of children has kept me from repeating it year after year, but I really believe this can be a fun, helpful, endeavor. I bought a very pretty but inexpensive calendar – book style – with several pages for each month. As the gardening season began that year, I made notes in my calendar of projects to do next year. Sounds kind of crazy, but if you garden long enough you begin to understand that a good bit of gardening is planning for next month or next season or next year. Using a calendar enables you to “schedule” the idea within the appropriate month for that particular project. For instance, if your idea is to plant more daffodils, place it in the calendar in October for fall bulb planting. It helps you stay organized and have fun in the planning stage. Let’s pray for drier weather. Have fun gardening! 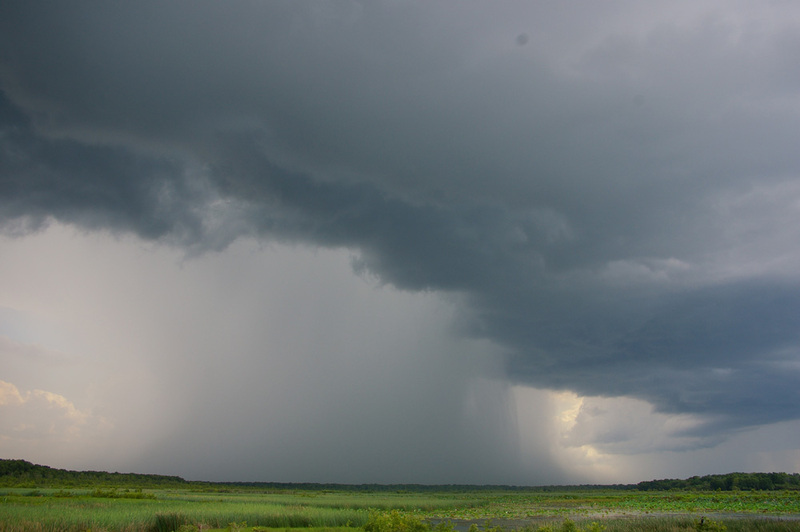 Picture of a thunderstorm at the top of the post is courtesy of Bidgee and is available on Wikimedia Commons. My garden sits along a deer path. I don’t know whether to be happy or angry about this. So many times, in the evening especially, we can look outside and see deer in the front garden. Many times when we are driving home we will see them at our neighborhood’s front entrance. I’ve always thought it a little strange finding a creature so large just standing next to my driveway. To me, it is exactly like coming home and finding a unicorn munching on your boxwoods, then turning and running into the forest. I never see deer in my yard without finding it a magical experience. 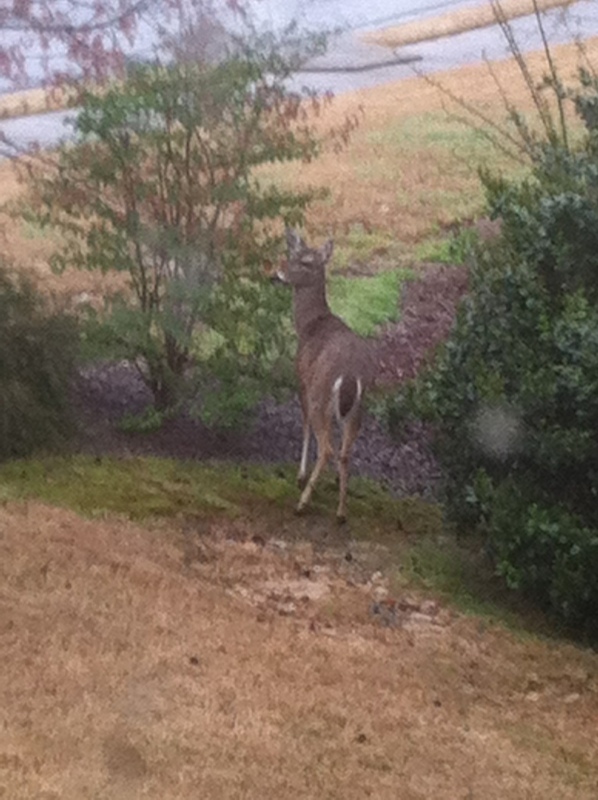 Every deer I see running through the garden always enters and exits by the same route. It’s puzzling. They must have a path with food along the way that they follow. I guess my house is just one stop along their merry little way. Most gardeners that contend with a deer problem are always very angry about the issue. I’m lucky in the fact that a neighborhood designated dog area is next to my front garden. I think the doggy smells tend to hurry them along their way. So, I get the bonus of observing them, without too much of the “plant munching” heartache. I do find it strange that what little damage I have tends to be only with certain shrubs or plants. A Oakleaf Hydrangea has gotten munched while 10 feet away the same type of shrub was not touched. A hosta, I’ve read, is one of their favorites and yet the hostas in my front garden have not been eaten. I don’t understand and at the same time I’m not complaining! I’m glad they are not decimating all of my plants, but I’m intrigued by their picky eating habits. The picture I’ve included is not the best quality, but it was taken by my phone out of our dining room window. You have to be quick to snap the picture before they leave. I’m happy that they leave my vegetables alone. I believe it’s because my veggies are in the back behind our 6 foot high fence. A friend told me, “Don’t kid yourself! They can jump your fence with the finesse of a ballerina. The reason they haven’t yet is that they can’t see where they will be landing.” So for now, I guess my veggies are safe. Spray deer repellent on and around the plants that are being munched. The smelliest sprays tend to work the best. Reapply every week. I personally would not spray edibles. Put up deer fencing. This can be expensive, but it will be effective. Maybe put it up only in certain areas, like veggie beds, instead of spraying. Try putting dog or cat hair around the areas that are being visited by them. After you brush Spot, deposit the hair. Or, better yet, take a trip to the groomers and leave with a bag of dog hair. Crazy, but I bet it will work! I have heard a lot about Irish Spring soap being used as a deer repellent. 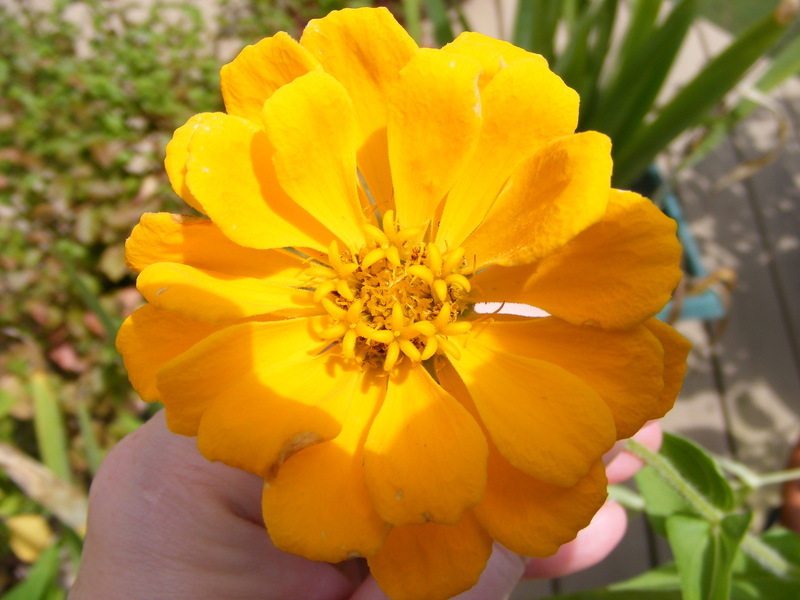 Place it in a mesh bag and hang it from branches or attach it to the end of a stick placed in your flower beds. Many people swear by it! And of course, I couldn’t end this subject without mentioning the unmentionable. Although you will never see me spreading urine in my garden, by all means pee to your heart’s content. I won’t tell anyone. Let me know if it works. Happy (and hopefully deer-free) gardening! I love perennials in a flower garden. There are so many to choose from and they come back year after year. Some are as tough as old boots and live a very long time. In the southern part of America, you can walk through forested areas and come across a stand of beautiful flowers. The house may be gone but the perennials are still flourishing where they were planted 100 years ago or longer. 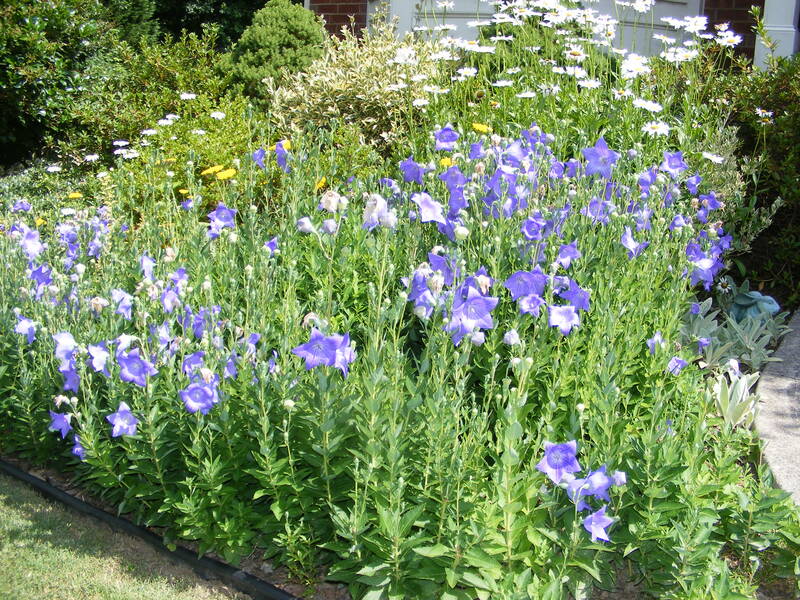 One type of perennial that I especially like are self-seeding perennials. The name says it all. They love to seed themselves around the garden. Sounds like trouble, but not really. The original clump of plant that you planted comes back the next year and brings some friends along. Sometimes the plant just keeps getting bigger and wider. And sometimes you find that the flower has seeded itself on the other side of the garden entirely. Because of this I try to be careful when I weed and let some seedlings grow-up if I recognize what perennial they are. Sometimes I don’t want them there and I just easily pull them out. 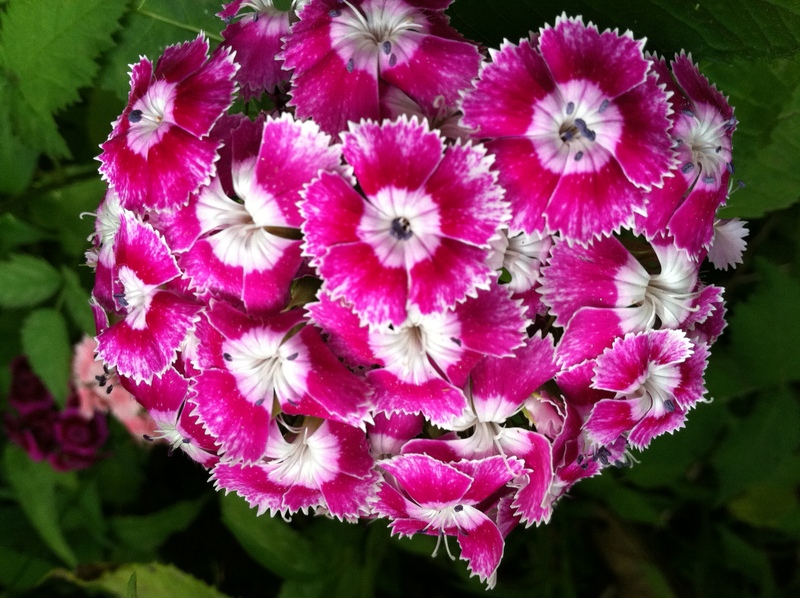 My 3 favorite self-seeding, flowering perennials are Balloon Flowers, Lamb’s Ears, and Sweet William. These 3 have given me so much joy in the garden. Every year that they come back, it’s like seeing an old friend drop by to pay a visit. 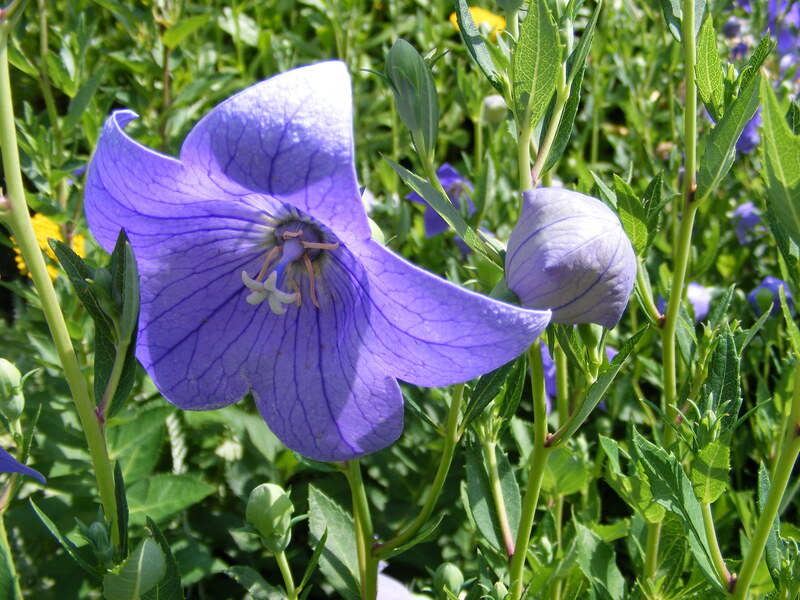 Balloon Flowers (Platycodon Grandiflorus) are some of the most unusual perennials. I just love how they look as they prepare to bloom. A large stalk reaches skyward and then tiny pea-like flower buds form. The upper most “pea” on the stalk will start to swell and resemble a tiny expanding balloon. When the balloon pops, you have a beautiful, open, star-shaped flower. When this flower fades the next “pea” in line starts to swell. Balloon flowers come in shades of pink, white, purple and blue. This wonderful plant has one down side, it can be top-heavy. 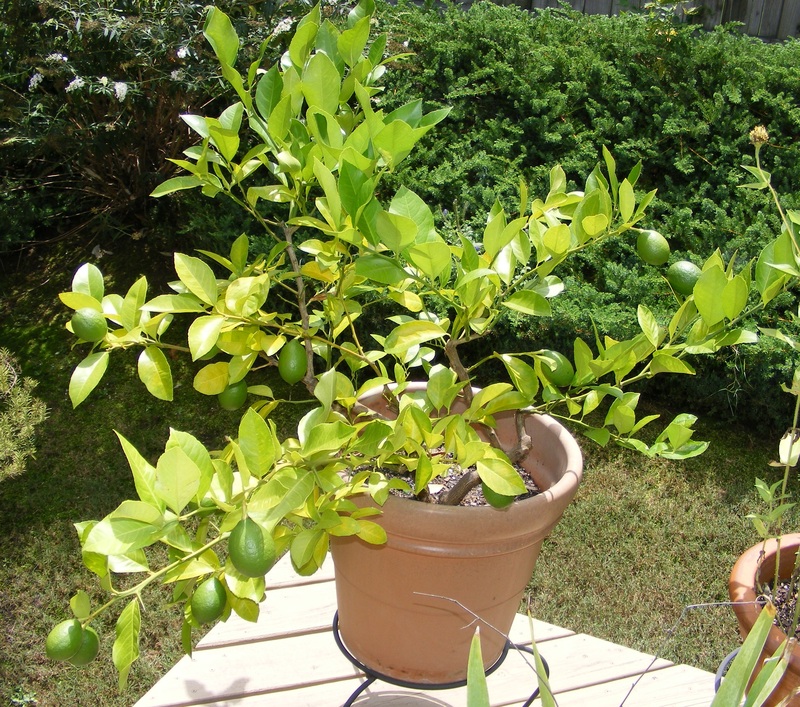 To combat this problem, I either stake them or most often shear them shorter early in spring and this creates a shorter plant that tends to not fall over. 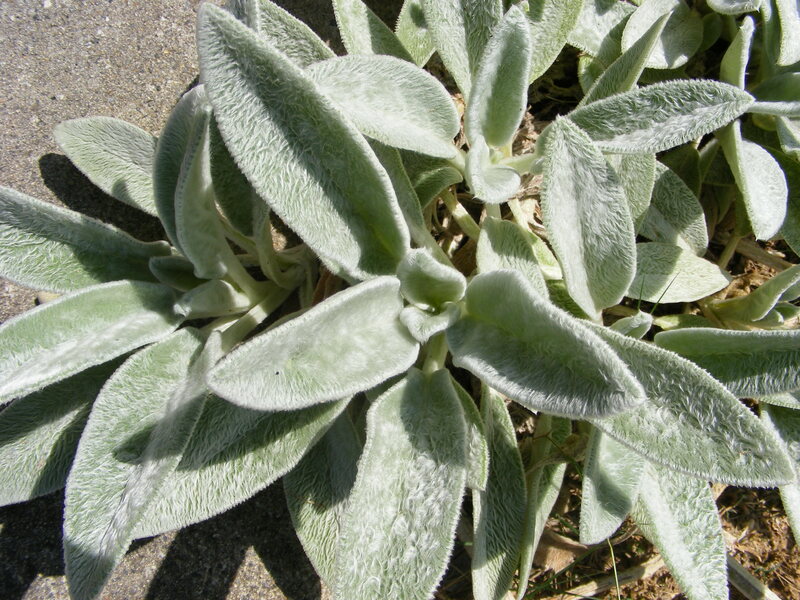 Lamb’s Ears (Stachys Byzantina) are a soft, fuzzy, gray flowering perennial. This plant also has a look that cannot be compared to anything else. It is unique. The base of the plant looks exactly like ears on a lamb. It is incredibly soft to the touch and its color doesn’t clash with anything else in the garden. The blooms are also unique looking in that they are tall, fuzzy spikes of tiny pink flowers. 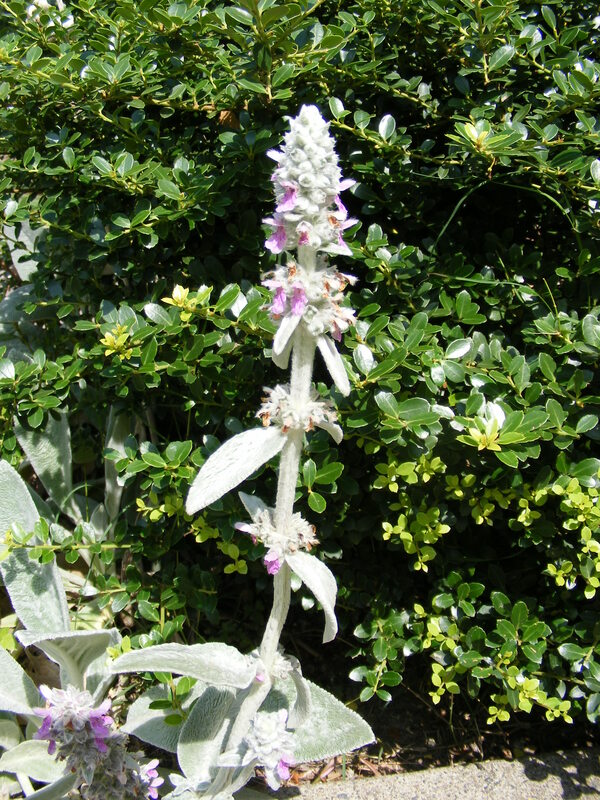 This plant is considered to be a perennial and a herb. I love this plant in bloom and without blooms. When the flower spikes have faded, I’m just as happy clipping them off and just having the “ears” left. 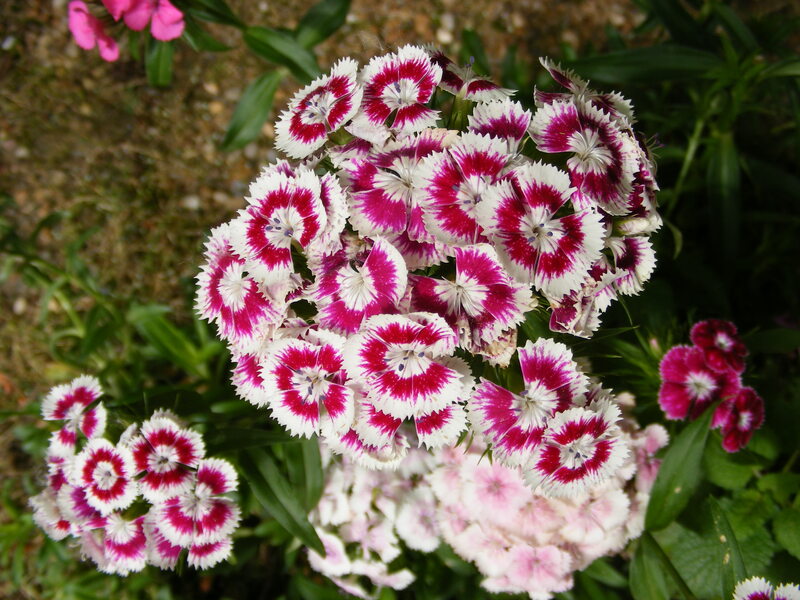 Sweet William (Dianthus Barbatus) is a member of that wonderful, sweet-smelling family that includes delicious, sweet-smelling Pinks. It ranges in colors from white to pink to lavender to red. This is a classic, cottage garden flower. Mixed together in various hues, and planted under rose bushes, you’ve planted a dynamite, cottage combination. This is described as a short-lived perennial, but I disagree. It should be described as a prolific self-seeder. It spreads its sweet-smelling self into large patches in the garden. And I’m so happy it does. I picked up a package of Sweet William seed at Jefferson’s Monticello because it was named after my lovable hubby. Over the years, it has turned into one of my favorite flowers. Even though these prolific seeders do a great job, I help them out. I love to cut down the spent flower stalks that have gone to seed, dump the seed in my hand, and then sprinkle the seed in a bare spot that needs flowers. One year, as I “dead-headed” a large patch of Sweet William, I whacked the seed laden flower heads around inside a paper bag. At the end of my gardening session, I ended up with quite a lot of seed to scoop out into a new flower bed. I love pictures in gardening magazines that show a large swathe of flowers all the same kind and color. This is the way to achieve those results. And on a budget, too. Happy gardening to all! I decided that if I’m going to grow blueberries, I’d like to eat a few, too. Last year I stood next to my blueberries, with fist raised to the sky, and shouted at the birds in the trees, “This means WAR!” I will never again water, fertilize, and mulch berry bushes to harvest only three berries. With this declaration of war, the wildlife around my garden looked a little scared, but I knew somewhere in the trees they had a war room in place and were strategically planning their attack. “Blueberries! We are going to build a fruit cage!” I declared. And thus it started. After exchanging many ideas, arguing a little and a lot of hand gestures, we started building a fruit cage for my blueberry bushes. I’m very proud. We used PVC pipe and glued only certain sections together, so that it can be taken apart and stored each year. It is 5 feet high and around 10 feet long. We attached wildlife netting to the piping with long twist ties and we pegged it down to the ground by taking a wire cutter and cutting long wire pegs out of coat hangers. This keeps it pegged to the ground and a little more stable. I’m very happy with it, but I think next year I will paint it a dark brown or black to make it less noticeable. My children believe that any day now I will go out into the garden and find Chip and Dale, giving me a little innocent wave from inside the fruit cage. I debated many weeks over whether I should write about one of the worst days in my life. Some people said not to do it. Some said that maybe the lessons learned would help someone else. I decided to write about it, to not only help someone else, but to maybe bring healing to myself. Please hang with me, I promise my next post will be about blueberries. I’m a traditional mom. I work in our home and raise our 2 children, ages 5 and 13. We live in a nice, quiet neighborhood in the suburbs. I never expected any trouble. I looked outside the front door and saw no one. I looked on the street and saw a car I had never seen before in front of my neighbor’s house. A man sat in the driver’s seat. I took about 10 seconds to watch him and noticed he seemed nervous. He looked up and then down the street as if he was watching for someone. I immediately realized that something was wrong. I quickly ran from window to window looking outside for anyone that shouldn’t be there. Nothing. Nothing again. What about there? As I reached the window over our basement door, I saw a bag of tools lying in the grass. I didn’t immediately see a person. I pressed my nose against the window and saw a man at my basement door. It hit me like a ton of bricks. Someone was breaking into my house! In a single split second, primal instincts came flooding into me. Protect my children, protect my children, protect my children! I had no weapons and no time. I screamed, “Call the police!” I hoped Nathan had heard me. Then it occurred to me. Scream. Scream as loud as you can! They can’t make me shut up and I’ll be the loudest siren I can be hanging out of this window. I threw open the window and let it rip, adding a few curse words directed at them for good measure! The two men below me stumbled back away from the house and looked up at me in the window. I don’t know what they were thinking, but I can tell you the look on their face was one of utter amazement. They didn’t think any one was home. And I guess they were amazed at how loud I was. They scooped up their tool bag and ran as fast as they could. Out of my garden, through the gate, and into their getaway car. I ran from window to window as I watched them flee. My heart was racing and I was drenched in sweat. I grabbed my cell phone and called my husband, out of breath I told him in one sentence what had happened. In one sentence, he told me, “I’m on my way!” Click. I found my children, hidden in a closet, on the phone with the 911 dispatcher. I tried my best to calm them and talk to the dispatcher on the phone. She immediately drilled me with every question you could think of, from what the men looked like to information concerning the car. She reassured me the police were on their way and asked if we were hurt. She was with my children while I tried to protect them. Thank God for 911 dispatchers. Whatever they are paid is not nearly enough. Thank God for police officers. One officer came directly to the house, while several others drove to nearby parking lots looking for the car I had just described to the dispatcher. One officer checked our basement for evidence and found they had broken a window trying to get in. Glass was everywhere! Police took photos of everything, even the footprints in the soft dirt at my garden gate. I appreciate everything the police did that day. We often don’t give them the thanks they deserve. Needless to say, I was upset and kept thinking what would have happened had I got in the shower just a few minutes before or if Nathan had not heard them rattle the front door. I truly believe God protected my family that day and I’m so grateful. It has been difficult for my family to get past this horrible event. There have been many sleepless nights. My youngest runs upstairs any time someone rings our doorbell. I’m sure it will just take some time for us to feel safe again. I know this post is not technically about gardening, but it did happen in my garden and I wanted to share it with you. The burglars have left my garden, but have not been erased from my mind. When I look outside I still see those men standing next to my flower bed. In the end, I’m glad nothing was taken and no one was hurt. We had to replace a window and clean up a lot of glass. A home security system can be a great deterrent – we now have one. Even if you don’t choose to buy a security system – buy a security sign for your lawn. Some can be bought on eBay. Drill solid brass pins through the upper and lower sashes of your windows. This is especially helpful on lower level windows. Thankfully, our basement windows were pinned already. One officer recommended getting a large breed of dog. This is currently being discussed in our household and we will probably do this. Robbers brake into houses most often in the daytime, when they believe homeowners are away at work. They are not looking for confrontation with anyone and want to rob an empty house. The officers told me to always answer a knock on the door. Ask loudly through the closed door who the person is and, if it is a sales call, tell them through the closed door to go away. This lets any potential robber know you are at home. They recommended locks on our garden gates, which we immediately added. In essence, you are throwing as many roadblocks, as you can, in front of the burglar. Between locks, pins, dogs, and security systems, we hope we are sealed up like Fort Knox. Comedy Blog Up and Running! Enter your e-mail address and WordPress will send you a notification when I post something new! © 2014 Sheila Larsen. All rights reserved.